Who else wants to become a guest blogging rock star? If you’re looking for guest blogging sites where you can post your guest posts in 2019, you’re in the right place. In this post, you’ll find a monster list of 170+ guest posting sites where you can publish your guest posts. We all know, Google slapped lots of blog networks and websites that were selling paid kind of links or were over optimized. Lots of link building techniques, which were working in the past, may not work any more in present or future. But guest blogging is here to stay for long. Google will never penalize your website for writing a high quality guest post on a blog that’s relevant to your niche. So.. are you ready to find out the massive list of blogs that allow guest posts? Let’s jump into the details. I created this list because it was so difficult to find good blogs to guest post on. It has the most up to date list of blogs that you can submit guest posts to on the internet and the software lets you track all of your submissions. They charge a very small fee so they can keep the list completely up to date. 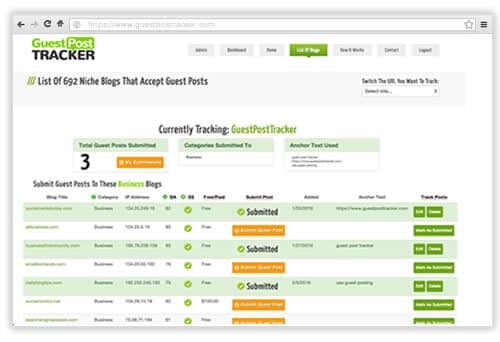 If you are looking to do guest posts then Guest Post Tracker is a must have tool. Quick Note: Do you want to start a blog? Here’s a simple step by step tutorial on starting your own WordPress blog within 10 minutes on Bluehost. Here is the ultimate list of popular blogs across different niche’s that accept guest posts. Against each blog, I have mentioned its guest blogging guidelines, contact details, its Alexa Rank and Domain Authority (DA). The following list contains blogs in Blogging, SEO, Social Media, Affiliate Marketing, Web Designing, Web Development, Finance, Technology and Health industry that are accepting guest posts. Hands down, the topic you choose for your guest post is what makes or breaks your guest posting success. So spend quality time in coming up with rock solid guest post ideas and here are few quick tips for you! Think like a reader: Before start writing your guest post, make sure to analyze the blog audience so that you can easily find out what type of content works for them. Make sure to go through the blog’s commenting section, social media profiles etc to know what they like and dislike. Do some quick research around the blog: You can go through the archive page or popular posts section of the blog where you want to guest post. That way you can come up with some topic ideas where you can add some unique angle to get your guest posts accepted. Use platforms like Quora: Quora is the #1 Q & A platform which is used by millions of people worldwide which can also be used as a topic generation platform. You can use Quora to find popular and most trending questions around your niche to come up with topic ideas for your guest posts. To write a guest post that goes viral online, you need to do extensive research. You can’t spend an hour from research to writing a guest post because that kind of content rarely gets any attention. Use the following tips and you’ll be able to create a successful guest post. Use Google search strings smartly: If you want to find sites that accept guest posts in your industry, you can use the following search terms to look for sites which accept guest posts. Read guest post guidelines: Before writing a guest post for any website, you must know what kind of content they publish and what guest posting guidelines they follow. So make sure to go through the guest posting guidelines before you even pitch your guest posts to someone. Whether you know or not, your guest posting success will be mostly dependent on the connect with the blog owner where you want to publish your stuff. The single most effective hack to build relationships to land guest posts on other blogs is “start commenting on other blogs”. Yes, blog commenting helps you easily write guest posts. But here’s the thing: don’t leave one liner comments, make sure to write detailed, in-depth and thoughtful comments so they get extra attention. Make sure to connect with the blog owners on social media sites. Almost all of the bloggers use social media sites extensively as they’ll have to connect with their audience. So they are always open to discussions, you’ll get benefits if you connect with them regularly. Here’s a list of some of the essential blogging tools you need to win at guest blogging in 2019 and beyond. Quick note: The following tools will help you with almost everything from finding better content ideas to analysing the authority of a site to knowing email address of others to easily get in touch with them. Let’s now talk about each one of the above tools in detail so you can easily understand how to effectively use them to easily land guest posts even on authority sites. If there’s only one blogging tool (read SEO tool) you need to get access to, it should be SEMrush. It’s the ONLY tool we’ve been using for over 3 years now to increase our website’s search traffic along with the sales. If you want to become a guest blogging rockstar, start using SEMrush. It is not only useful for finding ultimate topic ideas for your guest posts but also can be used for analysing other websites where you want to publish your guest posts. The #1 benefit of using SEMrush for guest blogging is the ability to find better keywords and content ideas where you can find all the keyword metrics like top search results, competition analysis, relevant keywords along with the search volume, CPC of the keyword and more. If you’re still wondering about why should be using SEMrush for your guest posting journey, here are few interesting stats about the world’s #1 SEO tool. You can use this special link to get SEMrush free for 14 days (which is worth $47) and only available exclusively for Bloggers Passion readers for a limited period of time. WordPress SEO by Yoast is the WordPress #1 most downloaded plugin with over 40 million plugin downloads worldwide. It’s available in two options: both free and premium. If you’re a normal user, free option is enough for you where you can optimize your guest posts well for search engines like Google. You can set a primary keyword for each of your guest posts, use this plugin to optimize and start ranking on Google search even with your guest posts. Domain Authority (often known as DA) is a metric created by Moz that is given to your website which gives you an idea about how authoritative a website is. A website’s Domain Authority is measured on a scale from 1-100 (100 being the best), so make sure to find those sites with at least 30+ DA if you want to write guest posts. You can install MozBar (browser extension) or use tools like Mangools tools to quickly find the DA of any website in the world. We recommend you to check out Hunter.io as it’s one of the easiest ways to find email address of any website owner. Finding email addresses of the blog owners is really important if you want to start your guest blogging journey. Most of the times, you can easily find emails by using their contact forms but there is also linkedIn with the addition of tools like Hunter, that helps you find more or less every email. Keywords Everywhere is one of the best free chrome extension for web developers, SEO experts, digital marketers and bloggers. If you’re looking for finding best keyword centric ideas for your guest posts, this is a must have tool for you. In one go, whenever you search for any keyword phrase on Google, you will get a ton of information that will help you gather relevant keywords, their number of search queries, CPC and it’s competition. Above all, it is free to use. Here are few do’s and don’ts of guest blogging sites. Do proper research before you start writing guest posts for any blog. The more time you spend on researching, the better quality of guest posts you can create. Do check out the popular guest posts (guest posts that went viral, created a lot of buzz, attracted lots of traffic, links and social shares) to find out what type of contents usually work better in your target blog. Do write your guest posts in a friendly tone instead of using a generic or corporate tone. Practice writing daily and you’ll get better at it. Don’t copy paste others stuff while writing guest posts. It can really damage your online reputation and no one appreciates duplicate guest posts (blog owners will simply remove if they find that your guest posts are not original). Don’t do guest blogging for the sake of links. It’s never going to work that way! Don’t ignore promoting or responding to the comments you receive on your guest posts. It helps you connect with other bloggers which goes a long way. Whether you are looking for the best guest posting sites in India or elsewhere, you need to write them well. While writing your guest posts, make sure to use the following smart writing tips and you’ll have higher chances to get your guest posts accepted almost on any website. The #1 biggest mistake most people make while writing guest posts is that they keep the best articles with them and send crappy stuff as guest posts. What’s the point of creating quality content and posting it to your blog when you’ve no audience to read that content? Instead, you can get better results if you publish that content as guest post on other blog which has bigger audience and more following. You’ll also get name, more traffic to your sites and some recognition online which you can later use to build and grow your blog audience. So start writing in-depth guest posts. We usually write 2000 word guest posts whenever we try to publish guest posts on other blogs and that’s the reason why 9 out of 10 times, they get picked up by other sites and get some traffic and links to our own site. It works! One of the biggest difference between a successful guest post and a failure one is this: solid references. If someone is giving you tips without actually talking about the topic in detail or providing your reference (to research more about the topic), the guest post will be rarely useful. So when you’re writing guest post for the next time, keep it in your mind to provide as many references as possible. If you’re using images, make sure to provide image sources by linking to the sites. Come up with at least one primary keyword for your guest post so you get long lasting search traffic to your guest posts which ultimately helps you get more clicks and traffic in the long run. When it comes to optimizing for search engines, title tags play a crucial role so take extra time to craft them nicely and also make sure to include a primary keyword within your title tag to get extra boost from search engines. Quick note: Don’t EVER stuff keywords as you write, just create your content as you would normally and optimize later while writing your guest posts. The best way to succeed as a guest blogger and find more guest posting opportunities is to namedrop other bloggers within your guest posts. You can include other bloggers best content within your guest posts or simply take others names to appreciate their work. Make sure to also email them personally once your guest posts go live so either they will appreciate or promote your guest posts. Or they even might give you a chance to publish your guest posts in the future. In any case, it’s a win/win approach which gives you a solid foundation. Keep your sentences short. Also keep your paragraphs to 2 to 3 lines. That way others can easily skim through your content and digest your subject. Here are few quick tips to format your guest posts that’s suitable for online readers. If you look at the above email pitch b Leo, you’ll notice that it’s short and sweet so make sure to write guest posting pitches which are really short and fast to consume (because no one has time to read long and boring email pitches). Also make sure to add references or your previous guest posting links (or your own blog post links) so the blog owners get an idea about your writing style which plays a big role when accepting your guest posts. Here’s a 10 point checklist that will be really come in handy for you on how to write an effective guest post which goes viral in 2019 and beyond. Use an interesting bio: Make sure your author bio that you use within your guest posts (mostly at the end of it) is interesting and stands out from the crowd. Also link to any landing page where you can capture leads instead of linking to home page. Respond to the comments: Once your guest post gets published on other sites, make sure to take time to read all the comments and respond to each one of them. Thank the blog owner: Immediately after your guest post gets published, email the blog owner and send a thank you note for publishing your guest posts. Most people don’t do this but this simple trick opens the doors and builds strong rapport with them. Mention other bloggers: If you’ve linked to other bloggers blog posts or contents from your guest posts, make sure to mention and tag them in your tweets or Facebook shares so they’ll know that you’re the one who’ve name dropped them. Use your best stuff: One biggest mistake most people make while writing guest posts is that they don’t send their best stuff and often send crappy contents. There’s no point of doing that practice as your intention should be helping others with your content no matter where you write. Edit like a pro: If your guest post has grammatical mistakes, no one appreciates it including the blog owner. So read your entire guest post at least twice to remove unwanted words and you can use tools like Grammarly to find and fix any typos. Do it for relationships, not links: Stop writing guest posts for links or traffic. Do it for the sake of building relationships with other bloggers and you’ll succeed! Send your guest post in the right format: Most publishers and blog editors tell you how to format your posts in their guidelines or email them to find out what formats works best for them. Share it multiple times: Once your guest post goes live, make sure to tweet it, share on Facebook groups multiple times until a week. This helps you get some traction and additional traffic to your guest posts. Don’t stop: Don’t stop writing guest posts even if they are working for you or not. Do it for at least few months so you’ll get an idea about how much benefits you’re actually getting from publishing guest posts. So far you’ve found out the massive list of guest blogging sites. Now, let’s talk about how to write guest posts that get accepted. Guest blogging is used in all niches, but it seems to be utilized to its full potential in Blogging, SEO, Making Money Online and Social Media Niche’s only. It’s not the case that people from other industries are not using guest blogging at all. Guest blogging has started showing its potential in other big industries like Health, Finance, Travel and Entertainment etc. To start doing guest posts, you need to have the list of top blogs in your niche that accept guest posts. With this post, I’m aiming at solving this problem of yours by sharing the list of 170 plus blogs with their contact details and popularity (Domain Authority and Alexa Rankings) in different niches that accept guest posts. What you have to do is approach owners or concern persons of these blogs with a polite email. You should highlight your intention to write guest posts for them. And in case you have already written guest posts for some popular blogs in your niche, please mention them as well in your email. Once you are finished with sending guest blogging request emails to 8-10 bloggers in your niche, wait for their responses. You should receive positive response from most of blog representative, as they are always hungry for fresh, unique and targeted contents for their blogs. Click here to know how to Build Your Reputation as a Guest Blogger. Now I’m seeking help from my blog readers. With this special post, I have compiled the list of 170+ guest blogging sites to write guest posts in 2019. Here’s a list of some of the important questions you must know about guest blogging and guest posting sites if you want to better understand the game in 2019 and beyond. #1. What is guest blogging? What are the benefits of guest blogging? Guest posting is a method of creating content for other blogs where you write an article and post it on someone else’s blog or website with your author bio (by linking to your site). To put it simply, in blog posting, you write contents for your own blog whereas in guest posting, you create contents for others. In return, you get quality links, traffic, subscribers and so on. There are 3 major benefits of guest blogging. Guest posting helps you generate leads, email subscribers and send you traffic if you land on authority sites in your industry. Above all, guest posting allows you to build a portfolio which you can later use as a social proof which creates a greater impact on increasing conversions and sales of your website no matter what industry you are in. So make sure to use the above mentioned free guest posting sites 2019. #2. How to start guest blogging? #3. Should I accept guest posts on my site? It really depends on your blogging goals. If you’re looking to outsource your blog content writing part or want to try to publish different opinions from different authors, you should definitely accept guest posts from others. If you’ve enough budget to spend on content or willing to write contents by your own, you can rarely or sparingly accept guest posts. #4. What are the best free guest posting sites in India? Here are few of the best free guest posting sites in India where you can write quality guest posts and receive massive traffic as they are widely popular. #5. Why is guest blogging important in SEO? So why should someone write blog posts for others instead of publishing on their own sites? The #1 reason is due to SEO benefits as guest blogging on other sites allows you to attract quality and relevant links to your site. Not only that, it also helps you build your network and improve personal branding which all help you increase your search rankings in the long run. #6. Do you know websites which pay guest bloggers? If you want to find a list of websites that pay, check out the post where you’ll find a list of over 20 sites where you can get paid to blog and writing. #7. How do I find quality guest posts for my site? If you’re running a fairly new site, it’s really difficult to find quality writers to write guest posts for your site (unless you pay them for each of the guest posts they write). If you really want to attract quality guest posts, try to build a high DA site with huge readership and you’ll definitely find unstoppable pitches from a lot of bloggers and writers worldwide. #8. Is guest blogging dead? In 2014 Matt Cutts, the Head of Webspam at Google announced “the decay and fall of guest blogging”. The whole blogosphere was in huge shock and slowly most bloggers stopped accepting guest posts to save their sites from getting penalized by Google. That also helped remove spammy guest posts from their sites and slowly people started creating only quality contents instead of generic posts. Guest blogging is NOT dead and it will never be as long as you adhere to Google rules and create quality contents for others. Just don’t do it for the sake of links, also focus on relationships to have better impact in the long run. We would love to see those great guest posting sites in the list mentioned above. We’re aiming at making it as the one stop shop for guest bloggers seeking websites for guest blogging. Let us know if you’ve any guest blogging sites recommendations. Do you know any popular blog in any niche that accept guest post, please let us know in the comments section. While I haven’t started guest blogging I was always wondering how people find the right blogs to get started with. I’ve bookmarked this list so I can come back to it when I actually am ready to get started. Makes my life easier so I don’t have to go hunting for all the blogs that accept posts. Thanks for this and have a great day. It is a great article to me, I was looking for some guest posting website which has a huge domain authority and fortunately I got many guests posting blogs site list from your article. It met my wildest expectation and I think it will help me a lot to guest post to generate visitor for my blog. Thanks to sharing such a great piece of article. Hi, Anil and all participants! Thank you to post this really grateful list of blogs which accept guest posts. Great job! This strategy is very helpful for webmasters to create high-quality SEO backlinks. Your suggestion guest post list is awesome. Thanks for sharing such a great informative article. Great job!. I think your post must be helped to me guest blogging and create SEO backlinking. Your list just awesome. Again thanks especially Anil and all participants. Thank you so much for taking time to post this useful list of blogs which accept guest posts. I would recommend you go for the websites that are closely matching with your blog. That’s so true. There’s no point to writing for irrelevant blogs and those links won’t add much value to your overall website’s backlink profile! Hey Anil, This is amazing full in depth guide, Nailed it… I would love to share with my subscribers. Also you can add my blog in this list…Please add my blog to the list as well. Thank you Anil for providing wonderful list of guest posting sites. I came through this post via HBB Facebook group and it will definitely help me to understand what kind of posts bloggers post on above sites and can later contact them to write detailed related posts. Charles, I would recommend you go for the websites that are closely matching with your blog niche. This will surely help you in getting more traffic from Google and at the same time, you will be able to spread more words about you and your brand. Yes, guest posting is definitely a great way to build links. Just make sure to ask for links. When you write a guest blog post, be sure to ask for a link to your website in exchange, there are people who remove links after your guest post gets published or there are few bloggers don’t provide dofollow links. Do let me know if you’ve any questions. These are really an amazing list of guest post accepting websites. I was just looking to increase my website traffic and somebody told me that still guest posting the best way to get it.Thank you for sharing list. Guest posting is definitely a great strategy to build links Neha, not only that you can with guest posting, more people that read your content, the more likely that they are to visit your website and become paying customers, which ultimately means more money for you. Just make sure to write quality guest posts instead of churning out generic contents to get more rewards in the long run. I couldn’t thank you more for sharing this Guest blogging list! I actually saved this article for reference purposes. I am looking forward that this could help me with guest posting. This is such a great article! Thanks a lot! Glad you found the list useful, just make sure to create list of only those sites that are completely relevant to your niche and audience so you can build links which are relevant to your site. Don’t go out of your way to build links by writing guest posts on irrelevant sites. It can do more harm than help in the long run. I am struggling with finding a good guest posting site. I got many but most of them are only allow paid or sponsored post. Thank for this list of guest posting website. It will help me to do more guest post to get huge traffic to my blog. Yes, ever since matt cutts said about the death of guest posting, most bloggers got scared and stopped accepting guest posts (from beginners especially) and that’s when they started accepting only paid posts. That way they can make some money, there’s nothing wrong in that though. But there are still many more sites (mentioned above) that accept quality guest posts for free. You just need to write quality stuff. Anil G, This Article is Awesome, You Are doing Great effort. Keep It Up Bro. Thanks for your suggestions, we’ll looking in to it and let us know if you’ve any more ideas about the sites that have high DA and accept guest posts quickly (rather than asking for money), we’ll consider your thoughts. Thanks! Thanks for this great article and links to the guest blogging websites. And yes, SEMRush is a Very good tool for SEO Purposes. I also use Majestic and Ahref for a second and third opinion. Thanks for putting this list together for us so we can get started with Guest Posting. I’ll be sure to bookmark this page as I plan on submitting more guest posts next month. Your list will definitely save me some time from having to go out and find bloggers that accept guest posts. Hi Susan, awesome that you’re bookmarking the post, and yes, we’re going to update this post as often as possible with all the sites (with high DA) that accept guest posts. It’ll be really useful for the users as well. Also take guest posting with a grain of salt because depending on your industry, you can generally drive more traffic to each post and get more traffic than you would from a guest post. Cheers. That’s so true Steve as guest posting is not just for the sake of building links. It can also improve your overall search rankings if you’re building links with proper content marketing strategy. As you said, not only does guest blogging allows you to position themselves as a great source, but it’s also beneficial for search engine optimization if it’s done properly. This is a great list of blogs that accept guest posts. I don’t spend enough time writing guest posts and I need to write more. It’s nice to have a huge resource with links like this. I can now work from this list and focus on writing more. I totally agree that guest posting can be a great benefit. While I don’t currently get a lot of traffic from my guest posts. Thanks Anil for proving amazing list of blogs, Beside these I would request to get the blogs from medium difficulty to get outreach approved. I’m adding a blog that would be helpful for straggler and looking for guest post approved far more easily than popular blogs. Thanks for the addition, I’ll definitely check out the site as I’m not only going for the DA metrics but also having a look at the blog’s traffic stats so the people who are interested in guest posting can get traffic back to their own sites. Can you add my blog socialtalky[dot]com I am accepting guest blogging under Self or Personal Development? Anil — Great blog post! Hey buddy, thanks for the addition, I’ll definitely check out the site as I’m not only going for the DA metrics but also having a look at the blog’s traffic stats so the people who are interested in guest posting can get traffic back to their own sites, so if your blog has that thing, I’d be glad to add to the list. You might want to check this post as well: https://bloggerspassion.com/list-of-high-quality-blog-commenting-sites/ (if you want to find a list of great sites to write comments for links and traffic). What a great list of websites for guest posting. I overlooked some of the points of guest posting before, but thanks for pointing them here.Again, a great reference for new bloggers to do some guest posting. Can’t wait to try them myself. Appreciate your work! Thanks Drake for the nice works, just remember one thing that networking and building relationships with bloggers in your field is more important than getting a spot on their websites with your guest posts. So don’t do just for the links, do it for traffic or networking. Thank you so much for taking time to write this amazing list of blogs which accept guest posts. Very helpful, indeed. Feel free to add our blog under the Health Category (homeremedybook.com). Again, congratulations on the great content that you provide! Hey Susan, thanks for the addition, I’ll definitely check out the site as I’m not only going for the DA metrics but also having a look at the blog’s traffic stats, so if your site is qualified for that (with proper traffic stats), I’ll definitely add it to the list. and I accept only fashion content. So I guess you might want to add a fashion section at last. Hi Vaibhav, thanks for the addition as there are few people who are looking for fashion related guest posting sites. I’ll definitely check out the site as I’m not only going for the DA metrics but also having a look at the blog’s traffic stats, so if your site is qualified for that (with proper traffic stats), I’ll definitely add it to the list. Was looking for guest blog lists for only health/fitness but not able to find a proper list. But thanks to your awesome post now I have a “LIST”. I would really appreciate if you could give me an idea on choosing the right hosting provider because I’m stuck between Bluehost and HostGator. Really superb list. I have one doubt that, if i get back links from non-niche sites, what will happen?. Please reply me. As a beginner struggling to get do follow links. Help me!! Actually it doesn’t matter from where you’re getting links unless you’re building links from spammy sites or those sites that have adult or illegal content in it. Just make sure to find a way to add relevant guest posts even on completely different sites (for example, you can write a guest post on “how real estate people can use marketing to increase sales” for a real estate niche site, if you’re running a marketing blog). So get creative and find your own unique angle to build links with your guest posts. Cheers. Actually both of these two blogs still accepting guest posts (they just are showing, we’re not accepting guest posts any more but you can see that there are a lot of guest posts are getting published on sites like problogger). So just reach out to them instead of giving up. Panchal. I’ll definitely check out the site as I’m not only going for the DA metrics but also having a look at the blog’s traffic stats so the people who are interested in guest posting can get traffic back to their own sites, so if your blog has that thing, I’d be glad to add to the list. A masterpiece by you. Thanks for sharing! I just want to ask you that whether we can submit our link on the first guest post we do on these blogs. Will this look natural or will they accept our post? Off course, the content quality will be the first priority, but if I pass the content quality requirement, will they accept the link. Yes, of course, you can ask for a link, in fact, you should only get your guest posts published on the sites that give you at least one dofollow link. Otherwise there’s no point of spending so much time in writing a quality guest post. It doesn’t matter what industry you are in, you can always find a way to build links through guest posts. You can write guest posts even on completely different niche site, for example, you can write a guest post on “why doctors should use marketing to increase sales” for a marketing or IM niche site, if you’re running a health blog. Hope you got my point, cheers. Anil, thanks so much for your efforts and you indeed did a great job. However, i try to contact some niches i’m interesting in, but most of admins said they don’t accept guest posts any more. Hope you could remove those websites and what’s more, some of the blogs recommended by their sockpuppet should be deleted directly. Please let me know the list of blog that aren’t accepting guest posts any more, so we can update this post with only those sites that are currently accepting guest posts. Cheers. Thanks for sharing a Big list of blogs that are accepting guest posting. I have checked in detail and I am must interested in Accounting and Finance Blog list. Because My blogs and company websites belong to Busines, so I prefer to use that one. Glad you found it useful and all the best, just make sure to write quality guest posts and focus on networking instead of guest posting for the sake of links. That’s the only way you can succeed in blogging. Great list of blogs that allows guest blogging. The only problem with Guest Blogging is that most of the people are trying to do because of backlinks and not because of other benefits like: very targeted traffic, brand awareness, personal reputation, etc. I really appreciate your comment and I agree with what you said as the importance of guest blogging is to increase the traffic, the SEO of your website. When you write guest posts, it is beneficial to ask for a link to your websites no matter what industry you are in. It takes a lot of efforts for making such a great post. The content is really helpful for almost all niche. Just wanted to check with you, If you can share some finance blogs who accepts guest posts India specific. If anyone have finance/business/b2b blogs who accepts guest posts, please reply in the comment. You need to be creative, it doesn’t matter what industry you are in, you can always find a way to add relevant guest posts even on completely different sites (for example, you can write a guest post on “how real estate people can use marketing to increase sales” for a real estate niche site, if you’re running a marketing blog). Hope you’re getting what I’m saying. It doesn’t matter what industry you are in, you can always find a way to add relevant guest posts even on completely different sites (for example, you can write a guest post on “how real estate people can use marketing to increase sales” for a real estate niche site, if you’re running a marketing blog). This is a great list that you have here. I am writing to request that our site, FairVendor.info, be included in your list of sites that accept guest posts. FairVendor.info is a business community for fair and festival vendors and we are looking for posts written by people who have businesses in this industry. If you need any additional information, please feel free to contact us via our website. If it’s a great fit, I’ll definitely add it to the list, the only thing is we always check for website traffic stats so others who are writing guest posts can get traffic to their own sites along with some exposure. Hi Sunil, if your blog looks like a a great fit, I’ll definitely add it to the list, the only thing is we always check for website traffic stats so others who are writing guest posts can get traffic to their own sites along with some exposure, so we’ll look into it. I am planning to write a guest post in future; fortunately, I landed here and you have given plenty of sites which allows guest posting, thank you very much for sharing this information with their domain authority, I will try one of those sites to test my guest post luck to drive traffic to my blog. Great and all the best for your guest posting journey. Just remember one thing that nothing is more important than establishing a relationship with other bloggers while guest posting. You can leave comment on other blogs or mention them in order to increase your chances of getting your guest posts landed on their sites in the future. Waa..Thanks @anil for sharing this article with the rest of your readers. You have mostly covered all the top niche blog, but you forget to mention the name of Programming related blog. Now day, many programming language like Java, PHP, ASP.NET, C++, HTML5 and many more are used in making different type of software, apps ,i hope you will try to add them also..
I’ll definitely add that category in the future, thanks for the suggestions Vikas, just make sure to know one thing that guest blogging gives you the opportunity to reach a wider audience and it also gives you the opportunity to brand yourself as an expert in your field no matter what niche you are in. The best thing I loved about this guest post blog list is that you have made direct link to submit guest post as well as contact link. I have tried some of the above listed blog but I have got errors while registering as contributers and that no reply from administration, so that was disappointed. Though most of blogs are fast in responding. Glad you found it useful and yea, we made sure to craft this post as useful as possible even for beginners so they can directly get in touch with the blog owners to start publishing their guest posts. Really, you are doing such a great work. thanks for sharing such a valuable information with us. It is very helpful to increase website traffic and Rank. Surely soon I will update it with the latest PR and Alexa Ranking. Actually I’m waiting for Google PR update. My food blog is also a social blog, so I accept guest posts too from social media, blogging tips and social media marketing. Thanks a lot for including my blog in the list! It’s now close to 200 sites that accept guest posts. Yes, this post took a lot of time to create because you need to constantly update the post with latest DA stats and remove all the sites that are not accepting guest posts any more. But it’s worth every single minute as it’s generating some great traffic from search engines like Google. Did anyone have fashion or shopping related blogs for guest posting. I just added some fashion blogs to this list that allows guest blogging. great blog and a nice list of blogs but they are not i guess in order of traffic..! still you did a great job with research..! I missed it somehow. Just added We Blog Better under Blogging category. thanks for sharing this great list ! Hey there! Thanks for listing my blog, Right Now In Tech here. Can you change the instruction “email here” and link to the guest posting page? I get a ton of emails from lists like this from people inquiring about guest posts. I then have to point them to the guest posting page on the website, which has all the instructions and asks them to send the article directly instead of asking first. Just made the change as per your wish Antriksh. I hope it will be fine from your end. As the non stable algorithm of Google, the best and effective way of exposure and link building is guest posting. Great list Anil. Hi Anil nice share, my site also accept guest blog post kindly update it into Technology Section. Great list of blogs you have listed here and awesome tips that you have written. Thanks very much, I shall check out these blogs. You can also add Comptalks in the Tech niche websites as it’s PR4 and is better than many sites listed in this article. Your blog is now listed under technology blogs that accept guest posts. Wow very Tough job Anil :). BTW thanks for adding My Site. Thanks. The list is comprehensive and real helpful to many bloggers around the world. Would you mind including my blog too in this list fr guest posting … http://www.websigmas.com – it is a blog in web marketing tips. This is an impressive piece of job! It should have taken hell lot of time and effort to compile and yes, I feel so proud to be included. The more I read about guest blogging the more I want to do a guest blog. I still have not gotten enough courage to offer to do a guest blog Maybe I am afraid of rejection. I do write a lot of posts on my different sites but “yikes” I just can not get the courage up… I am going to keep reading about guest blogging until I decide to go for it. Very resourceful list Anil, going to take some time to get through those but could be useful so thank you. I already guest post on several of these, they’re great. Just a note we also allow for guest posting Anil 🙂 Would love to be added to your list. Keep up the great work. Hi, I was finding blogs which accepts guest post and I found this link. I want to introduce my sites techtricksworld.com(PR 3) and 2012onwards.com(PR2), Both accept guest posts. Please include these 2 into your list Anil. Just added the first one under technology. For the second one, I’m thinking of adding a special category for mobile phones or electronic items. I will be adding that once I found some blogs in that category. In case you know more blogs matching that category, please email me those. I will add them to this list. I have no idea about others blog of same kind. But if you want then you can list that to the technology category and write in bracket as(only mobile technology). Sure No issue buddy Thanks for everything. Nice detailed list. I like it & it is helpful for me. Thanks for providing such informative post. Keep It Up. Thanks Anil. You have done a fantastic job here. Hey Puneet, Thanks for suggesting my site here. appreciate it. I searched Google and found out your blog post. Thanks for the comprehensive list as I am finding some blogs to guest post as well. By the way, my site is accepting guest post and that’s great if it could be added to your list. This is a great list of blogs that accept guest posts. I need them so much to build my brand and drive targeted traffic to my blog. Would love to see WPKube added in the list. Wonderful list… I was planning to do guest blogging on few blogs. And anyways you can add another category related to Internet Marketing. I recommend everyone to get in touch with people within their niche and actually get to know them (by leaving comments, Twitter, etc). By doing so, popular bloggers might actually consider your posts even though they doesn’t “allow” guest posts. Taking a look at the list, none of the health blogs seems to have a community around them (0 comments) and because of this, a guest post would probably result in few returning visitors. What you want, is to publish a guest post on popular blogs with a lot of comments. By doing so, there’ll be better chance of actually getting returning visitors who are interested in participating in your “community”. It takes time and more work but the result is worth it. Hi Stefan,,, This is so right on the money! Writing an amazing post does not really do much for either the blog owner or the guest blogger if nobody reads it. Networking within your little segment of the internet is absolutely worth every single minute of the time you spend doing it. I have met some of the nicest people on the internet that I never would have in real life—and it is wonderful to have others to bounce things off of and collaborate with. Hi Anil, thanks for taking the time and doing the research to compile this list. I’m proud to be listed here. Thank you! Hi Anil, Great post! Please add my blog to the list as well. It is about writing, blogging, freelancing and is PR3. Only one thing I would add to your post– be courteous and value other’s time….both guest bloggers and blog owners. Thanks! Thank you Anil for adding my blog in the list.